AMD’s next-generation A-Series processors, code-named Trinity, are the chip manufacturer’s answer to Intel’s new Ivy Bridge processors now appearing in the new Ultrabook laptops. How much of an improvement do the new Trinity chips offer laptop users and can these new Trinity-based laptops compete against Ivy Bridge? The reviews are in. Every new generation of chips promises better performance and energy efficiency, and Trinity is no exception. Earlier this year, AMD claimed Trinity would offer significant improvements over its current Llano chips: An overall performance increase of up to 25 percent, 50 percent better graphics performance, and double the performance per watt. Intel is still the market leader in this highly competitive chips race and, unfortunately, going on CPU performance alone, Trinity still lags behind. Both VR-Zone and HotHardware say the Trinity A10 gets “blown out of the water” by Intel’s Ivy Bridge Core i7 CPU--and even against Intel’s second-generation Sandy Bridge mobile chips in some tests. AMD positions its top-of-the-line A10 series against Intel’s lower-end Core i7 and higher-end Core i5 chips. 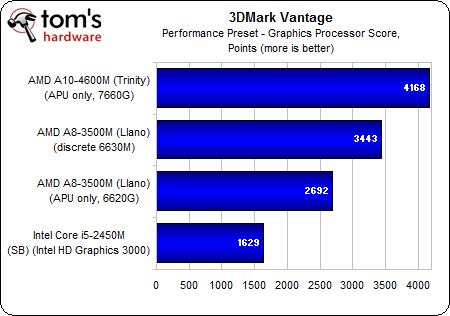 Yet an Ivy Bridge mid-range i5-2410M had a 25% CPU performance advantage over the Trinity A10-4600, according to AnandTech’s comparisons using PCMark. Still, AnandTech says Trinity’s new is a step forward from the CPU cores used in Llano. Trinity was about 20 percent faster than Llano in the reviewer’s general CPU performance tests--close to AMD’s 25 percent promise. As with Intel’s Ivy Bridge, AMD Trinity’s biggest gains are on the graphics side. Tom’s Hardware found Trinity “soundly beating its competition” in graphics processing and--as you see in this chart--in this testing, Trinity leads even against a Llano laptop with a discrete graphics card (the older 3DMark Vantage metric was used to compare against the Intel Sandy Bridge chip, which doesn’t support DirectX 11). Trinity even bests Intel Ivy Bridge’s impressive graphics performance: The HD7760G integrated graphics processor (IGP) had a 30-percent to 50+-percent performance gain over the Intel HD 4000 IGP in an Ivy Bridge Core i7 chip, according to HotHardware. This finding would make Trinity really impressive for gaming. 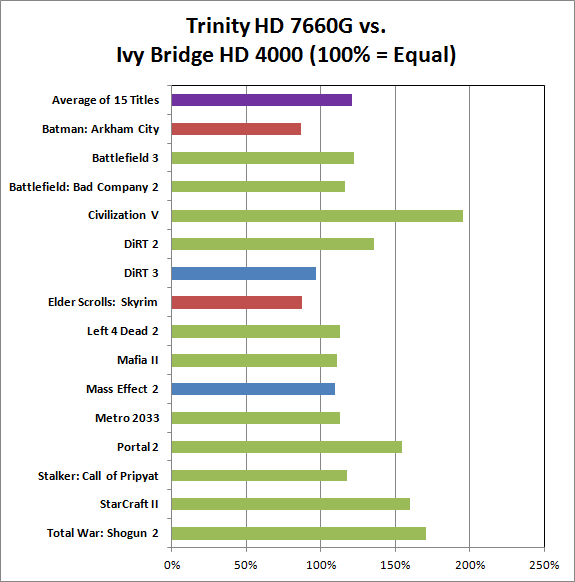 Hexus said the chip “offers best-in-class performance and enough grunt to play modern games at reasonable image-quality settings.” In AnandTech’s tests, Trinity had an average 20% lead against Ivy Bridge when comparing performance over 15 game titles. For 11 out of the 15 games, Trinity came out on top. AMD also managed to significantly improve battery life on Trinity compared to previous AMD chips and even when compared to Ivy Bridge--even though Intel uses a new 22nm production technology, while Trinity still uses the 32nm process of older Llano chips (smaller chips tend to be more energy efficient). 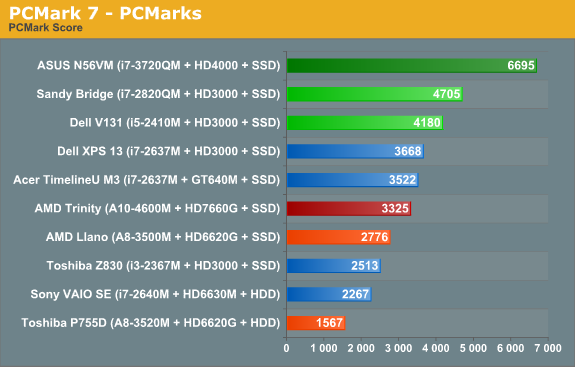 In this AnandTech chart, look at the red bar for Trinity, orange for Llano, and dark green for the Asus laptop equipped with an Ivy Bridge processor to see the battery life performance differences. AMD claims 50% better battery performance from a Trinity laptop versus Llano--up to 8.5 hours of browsing or 4 hours of YouTube video streaming, according to Slashgear. Taking the synthetic test results (on a prototype laptop) with a grain of salt, an AMD Trinity-based laptop may tempt you, depending on your needs. If you require a mobile powerhouse with the best processing performance possible, an Intel quad-core i7 will be your better bet. But if you’re a gamer or want longer battery life in your laptop, AMD has an edge over Intel. And despite the less-than-overwhelming overall CPU performance gains, Trinity-based laptops will be more than fine for mainstream tasks. Also not to be dismissed: Trinity-equipped laptops will, in general, be cheaper than laptops equipped with Ivy Bridge processors. For instance, AMD’s ultrathin laptops are set to be priced about $200 lower than Intel Ultrabooks. The HP Envy Sleekbook with AMD processor is the first example of this; the Sleekbook is $150 cheaper than HP’s new Envy Ultrabooks with Intel processors. Stay tuned for more AMD Trinity-based laptop news and reviews.